When the final Mcgill Reporter issue of the semester hits the stands on June 7, it will mark the end of the regular print edition of the paper. From that point onward, the Reporter will live almost exclusively online. While details are still being finalized, the print edition will still resurface for special occasions like the beginning of the academic year and Convocations. While it is easy to pity the poor paperboy in an increasingly electronic world, ultimately his loss is the environment’s gain. In an effort to save resources and money, publications are pushing readers to their online editions – decreasing their print runs and, in more and more cases, eliminating them all together. Put the McGill Reporter in the latter category. When the final Reporter issue of the semester hits the stands on June 7, it will mark the end of the regular print edition of the paper. 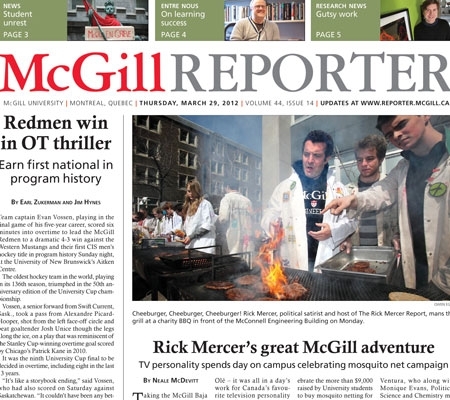 From that point onward, the Reporter will live almost exclusively online at www.reporter.mcgill.ca. While details are still being finalized, the print edition will still resurface for special occasions like the beginning of the academic year and Convocations. Add to that the paper used in the more than 3,000 mailings of the Reporter and the fuel consumed to ship each issue across the country from Halifax, Nova Scotia to Burnaby, British Columbia as well as to the 68 McGill-related buildings, residences and teaching hospitals in Montreal and that carbon footprint is made even smaller. Environmental benefits aside, the University will also save close to $50,000 annually in printing and distribution costs by moving the Reporter online only. In these challenging economic times, these kinds of savings are significant – and one reason why a number of other Canadian universities, including Concordia University and the University of Toronto, have also eliminated print versions of their staff and faculty papers. This spells the end of a 44-year run in print for the Reporter, which was launched in 1968 as a weekly newspaper under the guidance of editor Harry E. Thomas. Over the years, the Reporter has undergone some radical changes. Early issues are testaments to an era in which content was king – with page after page awash in a monotone sea of black type occasionally broken up by a stray photograph. Today’s issues are in keeping with the evolution of print media, in which content is supported by an increased use of photographs and white space. Marcil doesn’t believe the move to a primarily online Reporter will lead to a loss of readers. “Quite the contrary – I think we will reach more people,” he said. “We have to adjust the way we manage the website and we will have to refresh the content on a more regular basis. But we are hoping to be able to include video as well. It is what people are looking for in terms of their online papers now,” he said. To read an Entre Nous interview with Olivier Marcil, go to http://publications.mcgill.ca/reporter/2012/05/with-olivier-marcil-vice-principal-external-relations/.